The social cost of carbon — “SCC,” as it’s known. Sounds a bit wonky. Yet it is becoming a crucial new instrument in putting a “price on carbon,” even as for many its meaning remains elusive, hard to grasp. “It’s the most important figure you’ve never heard of,” says economist Michael Greenstone, a key architect of the concept as Chief Economist of President Obama’s Council of Economic Advisors. Michael Greenstone, a key figure in SCC planning. The government now has a specific number it can use to make rule changes, taking into account economic damages as a result of climate change. If policy X — let’s say, a rule allowing the expansion of a power plant — prevents the generation of millions of tons of carbon dioxide, multiply those tons by $37 to get the value of damages avoided by the rule. That number is then counted as a net social benefit. 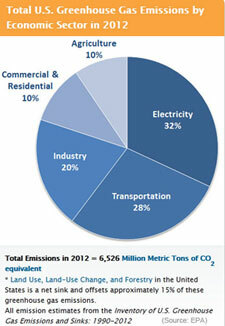 The activities of every American right now produce about 18 tons of carbon dioxide per year. About one-third of that, let’s say six tons, comes from transportation. So multiply six by $37, and you get $222. That’s how much the daily commute, rides to the grocery store and road trips — all our carbon-producing travel — cost in societal damages each year. Perhaps, however, you agree with Stanford researchers Frances C. Moore and Delavane B. Diaz and think it’s likely much higher (their recently published $220/ton figure means our commuting-to-work damages, etc., are somewhere around $1,320 each year). Some environmental groups have long been advocating for an even higher figure — $266/ton, and more. Reasonable people can certainly disagree — even by orders of magnitude, according to the National Research Council. “There’s no right answer…. I think it’s almost for regular people to decide, as opposed to people in the ivory tower,” says Joseph Aldy, an environmental economist at Harvard who was Special Assistant to the President for Energy and Environment in the Obama White House. “There are ethics involved,” he said in a recent interview. It very much comes down to “how we value future generations” — not an easy concept to pin down. It may seem arbitrary to some for the government to put a precise value on something so squishy as collective societal damage from climate change, but it’s increasingly common to try to proceed in this way. Government regulators long have put the statistical value of a human life at about $9 million. They have calculated the value of building more bathrooms as part of efforts to prevent prison rapes, and calculated the value of requiring cameras in vehicles’ rear-view mirrors to protect small children. Under President Ronald Reagan, the government mandated that new regulations need to undergo a cost-benefit analysis. But damages resulting from greenhouse gas emissions were not being taken into account in those calculations, and a 2008 federal appeals court decision ordered executive agencies to begin doing so. Officials such as Greenstone and regulatory “czar” Cass Sunstein — then the head of the Office of Management and Budget’s Office of Information and Regulatory Affairs — convened an interagency working group and began hammering out a figure. But how exactly has it been put into practice? An example: EPA and the Department of Transportation had to do a cost-benefit analysis for light-duty vehicles. Technology costs for companies to raise fuel efficiency standards were estimated at $350 billion over four decades. Benefits to society — for example, reduced pollution and congestion, and more energy security — were pegged at $280 billion. So higher fuel efficiency standards don’t pass muster: They are $70 billion in the “red.” Yet once the social costs of carbon are taken into account, cost-benefit analysis showed net benefits of more than $100 billion. Now the higher standards and new rules can move forward. The figure first came to real public attention in 2013, when it was applied to new rules for microwave ovens. That rule showed that government regulators had raised the price from about $24 a ton to its current level. Its impact has not been overwhelming — yet. In a 2014 working paper for the Brookings Institution, researchers Robert W. Hahn of Oxford University and Robert A. Ritz of Cambridge University looked at the net benefits involved in 53 regulatory policies. It turns out that the social cost of carbon is low enough that it typically means only 14 percent of net benefits from a policy are accounted for by reducing carbon; and weighing the social cost of carbon tipped the scales in favor of a different policy in only about 1 in every eight rule-making scenarios. Are You a 1-, 3-, 5- or 7-Percenter? The government uses three different models from the peer-reviewed literature to achieve a diverse analysis (they call them “IAMs,” or integrated assessment models), and then synthesizes them into a range of figures. 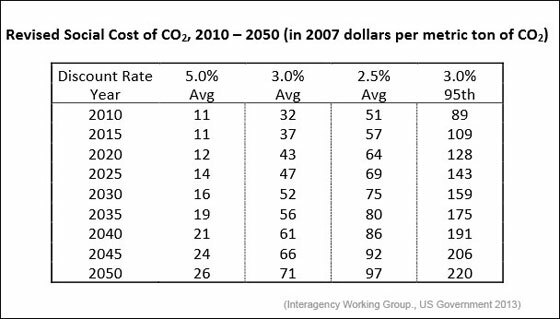 The most important thing to keep in mind is that the calculations very much come down to the “discount rate,” a statistical term that refers to how we value something into the future — in this case, avoiding the release of a ton of carbon into the atmosphere. Journalists and policymakers alike have attempted valiantly to break down and simplify the discount rate concept for the public. It’s worth just knowing that those favoring aggressive action on climate change now might fall into the 2.5 or 3 percent camp, or even lower. That means the value right now for avoiding a ton of carbon emissions is pretty high. (The famous “Stern Review” of 2007 had an even lower discount rate of about 1.4 percent.) Or, if you think avoiding more emissions in the short term is not as valuable, you’d fall into the 5 or 7 percent camp, or higher. The government runs all those scenarios, but the 3 percent is one that is generally used. Groups such as the Environmental Defense Fund (EDF) and the Natural Resources Defense Council (NRDC) say that the current $37 figure neglects a vast range of negative impacts. Even updating the current models won’t help that much, they say, as they are too narrow in focus. The University of Chicago’s Greenstone says that there has been an “explosion” of research on the economic impacts of climate change in recent years, none yet factored into the current models. He’s working with experts at several other academic institutions to formulate an updated model. Aldy notes that, so far, researchers and policymakers have “not done a good job” bridging the hard science and climate modeling and the economic impact scholarship. Heading into another presidential election season — where the future of this important, emerging regulatory tool may hang in the balance — many policymakers and academics are eager to enshrine, at the very least, a more regular process for revisiting and revising the figure in the future. Providing some predictability in an area of such uncertainty, they say, is the least we can do for future generations.